It appears a foregone conclusion that the multitalented young Natalie Portman will pick up the Best Actress prize at the Oscars this year because of her work in Darren Aronofsky's Black Swan. And while she remains the frontrunner, a closer look at her fellow nominees reveals that this is the one category this year that is completely wide open -- and the one that could truly spring a surprise. Here, then, is a look at the Best Actress catfight. First things first, Annette Bening. Not just is Bening brilliant in Lisa Cholodenko's sparkling The Kids Are All Right -- where she plays a lesbian parent struggling haplessly with her evolving family dynamic -- but this is the actress' fourth nomination, and it may just be time the Academy decides to salute her versatile filmography. Nominated previously for roles as spectacularly different as in The Drifters, American Beauty and Being Julia, Bening is a highly regarded actress long considered unfairly shafted by the Academy. Will they choose this year to go her way? They just might, more so because picking a lovely lesbian film might undo some of the damage they did when overlooking Ang Lee's brilliant Brokeback Mountain a few years ago. Nicole Kidman -- a multiple nominee who has previously won an Oscar for playing Virginia Woolf in The Hours -- provides a heartbreakingly nuanced performance in John Cameron Mitchell's Rabbit Hole. Working more as a showcase for its actors (Kidman and Aaron Eckhart are the leads) than as a film overall, Rabbit Hole gives Kidman a role to shine in. And she bites into the opportunity with carnivorous glee. Her Becca Corbett loses a son and tries hard to find a life, or at least a reason for one. Kidman is wonderfully understated and disarmingly convincing, and deserves all the applause she can get. Besides, Hollywood could do with one of its premiere A-listers drawing herself back up to her full starry height, and this would be just the ticket. 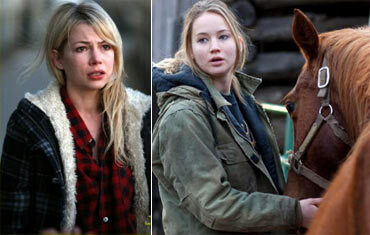 In Debra Granik's critically fawned over Winter's Bone, 20-year-old Jennifer Lawrence makes the jaw drop. Playing a dirt-poor teenager facing unbearable hardship, Lawrence's Ree Dolly is a marvellous modern-day heroine, a truly iconic character, one that ought to be celebrated by filmgoers and feminists alike. And then there's Michelle Williams, who startlingly breaks down the line between performance and reality in Derek Cianfrance's Blue Valentine. A highly disturbing and stirringly beautiful film about a marriage falling apart, Williams -- and leading man Ryan Gosling -- fearlessly act their pants off, to present us a film so authentic that watching it feels a bit like trespassing. Amazing stuff. Each of those four actresses deserves the highest of accolades. It's a rare year when five significantly exceptional performances are bracketed together, but this is definitely one such acting masterclass. The bookmaker's favourite, however, has to be the effervescent Natalie Portman. And with good reason. Her Nina whirls with tremendous, furious grace but without her dancing shoes on, spins off helplessly into a nightmarish world of despair, desperation and disillusionment. It is a performance with a drug-like appeal: one you might occasionally find too showy but one much too hard to look away from. And very, very intoxicating indeed. The pregnant Portman, 29, will probably pick up the trophy and pirouette her way into Hollywood immortality, but do me a favour and watch the four other nominees: the ladies have been something else this year. Hats off. Who do you think will win the Oscar for Best Actress? Tell us! Will Colin Firth win the Oscar for Best Actor? Will David Fincher win Oscar for Best Director? Dr Singh and the Oscars!